Aaron Gubeli has experience in the area of general insurance defence litigation, including the defence of municipalities, educational institutions, health authorities, professionals and businesses as well as providing insurance coverage advice. His areas of interest include professional liability, personal injury, and coverage. 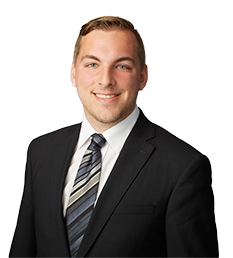 Aaron joined Guild Yule in 2017 as a summer articled student, after working for a personal injury firm in his first summer of law school. He is a graduate of the Peter A. Allard School of Law at UBC. During law school Aaron represented UBC in the BC Law Schools Moot, where his team won first place and he was awarded the Boyd Ferris Memorial Prize in Advocacy. Aaron also wrote the top essay in the Canadian Defence Lawyers Foundation’s Essay Prize Contest, which was published in Justice Archibald’s 2018 Annual Review of Civil Litigation. Further, Aaron was the recipient of awards recognizing his academic achievement, including the Harper Grey LLP Prize in Insurance Law, the Panvini Scholarship in Law, and the Tracey Gibb Memorial Scholarship in Law. Outside of academic pursuits, Aaron was involved in providing legal advice and representation to low-income individuals with the Law Students’ Legal Advice Program and as an Assistant Editor for the UBC Law Review. Prior to pursuing law, Aaron completed degrees in Business and Political Studies. Aaron enjoys hiking, skiing, soccer, travelling, camping, and spending time with his wife. Aaron is a Regional Referee with the British Columbia Soccer Association and can frequently be found on the local pitch.